Los Angeles Lakers star Kobe Bryant took some time out of running his Kobe Basketball Academy on Friday, July 9, to host a charity luncheon at the Boys & Girls Club of Santa Barbara. KVBFF is dedicated to reaching out to young people and families worldwide to provide financial resources and develop unique programs to make a difference. 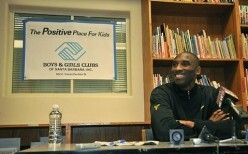 Follow Kobe as he tweets about his life on & off the court, and see what is going on at the Foundation. Sign up for the Mailing List to get the latest updates regarding the Kobe & Vanessa Bryant Family Foundation news, information, and events.